Alien life forms have spread throughout Central America leading to the quarantine of half of Mexico. The U.S. and Mexican militaries are battling to contain the creatures, with a wall stretching along the American border. The story follows Andrew an American photojournalist who is tracking down the rich-kid daughter of his boss and their journey back to America through the ‘infected zone. So, based on the trailer (see below) and the general synopsis and buzz about Monsters, I was pretty much expecting District 9 meets Cloverfield meets War of the Worlds. In Mexico. When I saw that the movie was available for early rental on iTunes, I was ecstatic (because 1. I have no time to go to the theater these days, and 2. early movie rentals in the comfort of your own home = WIN). I got my halloween candy and soda in hand, and settled in for a good ol’ fashioned scifi/action/horror romp. So, let’s talk about what worked. 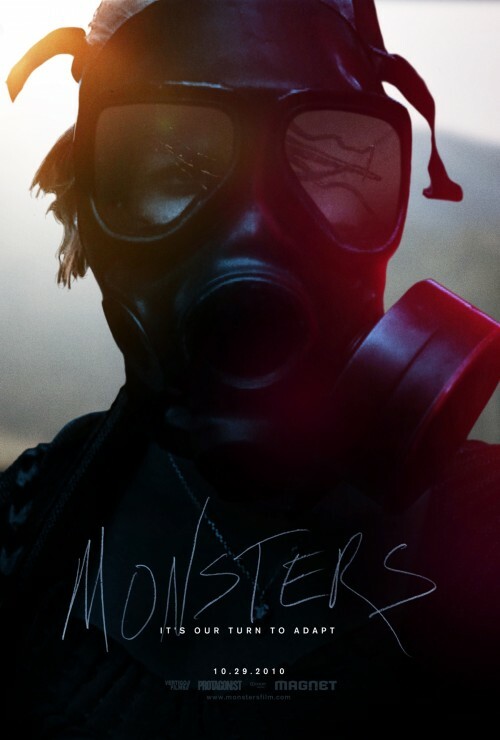 By far, the best thing Monsters has going for it is its absolutely stunning composition in terms of sound, visuals and cinematography – shot on location in Mexico, Belize, Guatemala, Costa Rica and Texas over the course of three weeks on a relatively small budget (about $500,000), Monsters is atmospherically superb and looks and feels like an expensive movie. Edwards manages to capture the wild beauty of the jungle, the crumbling relics overrun by wilderness (and monsters), creating a vibe that is both desolate and untamed. 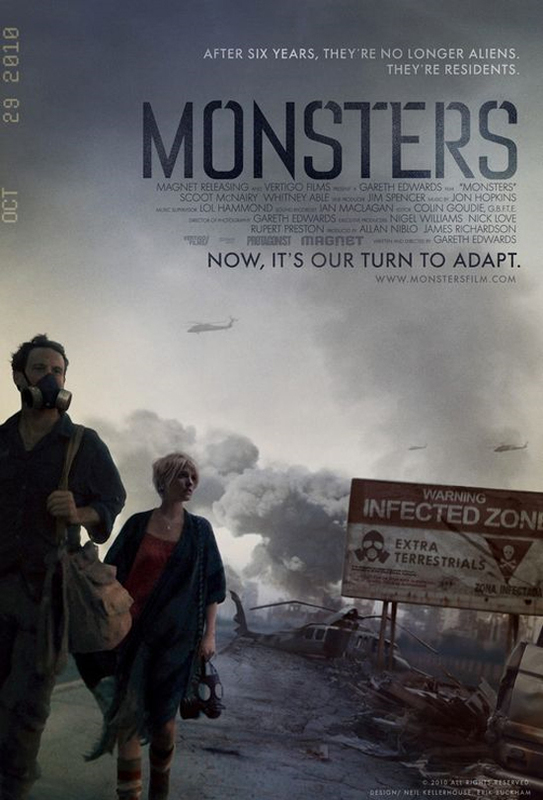 Even the titled “Monsters” (the few times you see them) are well animated – this isn’t some cheap effect SyFy Friday Night special. The amount of time and love Edwards put into each frame is abundantly clear. Words cannot express how thankful I am that Monsters was not shot in the Cloverfield, mockumentary style (which would have been unbearable). Unfortunately, visuals can only carry Monsters so far, and while I loved the premise and the idea of the film, the execution (i.e. the script) was sadly lacking. Monsters, rather than relying on huge action sequences or terrifying squid alien attacks is a more subdued film about two wayward humans, trying to find their way home and falling in love in the process. The chemistry between the two characters is there – McNairy and Able are a real life couple and were cast precisely because they are a couple – and both do a decent acting job. Where the execution stumbles, however, is with the actual scripting and narrative of the film. McNairy and Able were given to ad-lib the scenes and dialogue in the film, which, unfortunately, leads to stagnancy and repetition. This isn’t Neill Blomkamp’s District 9 with its sharp political allegory and tightly woven plot. Andrew and Samantha’s dilemma lacks urgency, and while their love story is nicely evolved over their journey, on their own merit, these characters aren’t particularly interesting or deep. And, even more importantly, the majority of scenes in the film are “empty” vignettes; that is, nothing happens. As visually appealing as Monsters is, it is the equivalent of style over substance. There are so many untapped reservoirs of potential with this movie, and it’s a shame that for all of Edwards’ skill behind the camera, ultimately Monsters fails because of its lack of narrative ambition and direction. Like its sleepy characters, Monsters gradually meanders and stumbles its way to a denouement, without ever really trying to get there. I recommend watching the film if only to enjoy Mr. Edwards’ formidable skill with cinematography – but I’d recommend waiting for a cheaper rental. One can’t help but think – what if some non-gratuitous Hollywood type picked up the movie, assigned it a real script and had Edwards at the helm for visuals? Now that is a movie I want to see. I was afraid this was going to be a District 9 rip off. Now your review makes me think otherwise. Sounds like a perfect DVD viewing. I got kind of excited hearing about this movie (as I hadn’t yet) but then to find it was slow was deflating. 🙁 I think I shall wait for it to come out on cable.